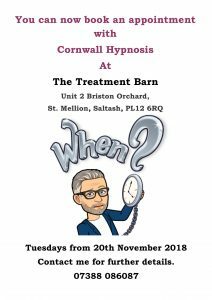 We are pleased to announce that you can now see Cornwall Hypnosis at The Treatment Barn, St Mellion as of 20th November 2018. The Diary is already open for bookings. Next StoryWould you like to learn how to hypnotise someone?